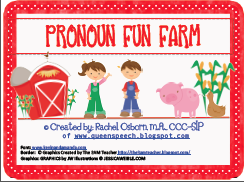 Pronoun Fun Farm is here! My first therapy game is here! 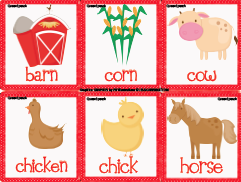 Also includes farm animals and some plurals! There are many different uses for these cards. 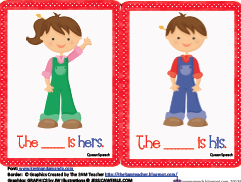 The way I play is have the students pick animals/objects cards out of a bag/envelope and then let them pick who it belongs to (hers, his, or theirs?). 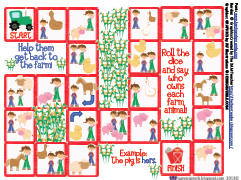 I have also included a game board once the students have practiced a few times they can help the boy and the girl take their tractor to the farm! I hope you enjoy this activity, I had a ton of fun making my first one! Cheers to many more! cool Rach, you made this? Yes! I buy graphics and make sure to give them credit on every page. I post to teacherspayteachers.com and I earn money!